The correct answer is all of the above. IBS symptoms vary from person to person and can range from mild to severe. Talk to your doctor if you have had IBS symptoms on 3 or more days a month for the past 3 months. Irritable bowel syndrome (IBS) is the same as inflammatory bowel disease (IBD). The correct answer is myth. 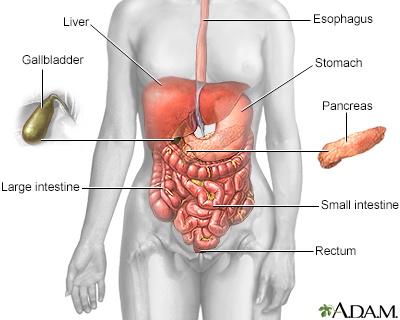 IBD includes Crohn's disease and ulcerative colitis, conditions that damage the lining of the digestive tract. IBS causes belly pain and abnormal bowel movements but does not harm the intestines. IBS is a common disorder. The correct answer is fact. About 1 in 6 people in the U.S. have symptoms of IBS. It is the most common intestinal problem that brings patients to a bowel specialist (gastroenterologist). Everyone with IBS has diarrhea. The correct answer is myth. Some people with IBS have frequent diarrhea, while others tend to have hard stools and be constipated. It's also common to switch between diarrhea and constipation. Bowel problems may get worse for a few weeks and then clear up for awhile. Discuss any changes in your bowel movements with your doctor. Doctors need to run a lot of tests to diagnose IBS. The correct answer is myth. There is no test to diagnose IBS, although tests may be done to rule out other problems. Most of the time, your doctor can diagnose IBS based on your symptoms, with few or no tests. Stress plays a role in triggering IBS symptoms. The correct answer is fact. Signals go back and forth between the bowel and brain. These signals affect bowel movements. Stress may cause the intestines to be more sensitive and to squeeze more often. Finding ways to relieve stress can help keep symptoms at bay. There is a special IBS diet that relieves symptoms for most people. The correct answer is myth. Dietary changes can be helpful. However, no specific diet works for everyone with IBS. This is because the symptoms differ from one person to another. Keeping a food diary can help you figure out which foods make your symptoms worse. Which foods or drinks are most likely to cause IBS symptoms? The correct answer is any of the above. These are common triggers, although not everyone with IBS will react to all of these foods. Avoiding caffeine is a good idea for most people with IBS. Caffeine can make the intestines more active. What type of medicines can treat IBS? The correct answer is all of the above. Your doctor will recommend medicines based on your symptoms. Always follow your doctor’s instructions when using medicines for IBS. You should not take a different amount or take the medicine more or less often. Doing so can lead to further problems. Low doses of tricyclic antidepressants can help relieve pain and discomfort even if you are not depressed. It's normal to lose a lot of weight when IBS flares up. The correct answer is myth. Unexpected weight loss of more than 5 to 10 pounds could be a sign of a more serious problem. Contact your doctor right away if you have weight loss when you are not trying, bloody stools, fever, or severe pain.